Choosing the right bed linen is vital to a worthwhile night of relaxed and comfortable sleep. In this guide we will explain the different technical aspects and attributes of bed linen, such as weaves, thread count and fabric content, along with distinguishing the different types of bed linen available. One of the most commonly used indicators of quality for bed linen is thread count. Put simply, thread count is the number of threads woven into a square inch. The fibres that are woven horizontally are known as the “weft” and the fibres woven vertically are known as the “warp”, it is these fibres that make up the thread count between them, for example a sheet with a thread count of 200 will have 100 weft threads and 100 warp threads. As a general rule, the higher the thread count, the better the quality of the fabric. However, some manufacturers add extra threads between the weft and warp which are known as picks, this increases the thread count but doesn’t necessarily improve the quality therefore it is essential to aim for unpicked fabrics. Thread count tends to begin at 150, sheets with a 150 thread count have a slightly denser feeling than higher thread count fabrics and are generally suited to guest bedrooms, holiday homes and so on. 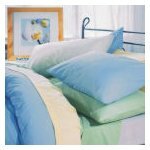 Linens with a thread count of 200 or over are considered to be high quality, 200 thread count pillowcases and duvet covers will have a comforting and crisp feel whilst also offering increased durability. 400 thread count bed linen boasts a luxuriously soft and light feeling, any bed linen made with a good quality fabric and a thread count of 400 or more can be safely considered 5 star quality. It is of great importance to identify the fabric that is going towards the thread count, as a high count of an inferior material will not result in a comfortable sheet. A 200 thread count sheet made from good quality fabric will feel infinitely softer and smoother than a 400 thread count sheet made from poor quality fabric. 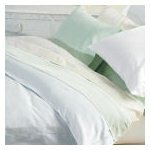 Cotton is the most widely used material for bed linen as it is naturally durable, breathable and comfortable. The best fabric available is Egyptian cotton, which is one of the finest types of cotton in the world. Egyptian cotton is grown on the banks of the River Nile and it has an extra long staple yarn which means it yields a much more continuous fibre which can be woven into a finer fabric. Although the fibres of Egyptian cotton are significantly better in terms of quality than standard cottons, they have a smaller diameter which means that more threads can be used per inch for a lighter yet stronger fabric. Egyptian cotton sometimes feels quite hard to the touch when it is new, however it will soften with each wash and become even softer over time. The nature of Egyptian cotton means it doesn’t product as much lint as other fabrics and this also means it will not pill or bobble like other textiles. 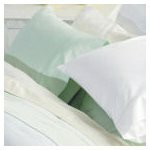 Brushed cotton is another popular material for bed linen as it is incredibly soft and smooth. This finish is achieved by brushing the cotton to remove excess lint and fibres which would make the fabric feel rougher if left in. In cases where the bed linen is not 100% cotton, it will almost always be a blend of cotton and polyester, which is known as polycotton. Polycotton is favourable as it combines the properties of synthetic and natural fabrics – the softness of cotton and the resilience of polyester result in excellent bedding that is comfortable and does not require ironing. Pillowcases and duvet covers are often described as “percale”, although this word may sound like industry jargon it has been traced back as far as 18th century France! Percale is a description of the weave itself rather than the fabric content. It is a closely woven plain-weave fabric which can be made using 100% cotton or polycotton. The weave is made using a combination of carded and combed cotton to produce a firm, smooth fabric which is medium weight and washed really well. Carded cotton is prepared for spinning into thread or yarn by brushing it from one brush to another, which ensures debris and it also aligns the fibres for a soft finish. Combed cotton is an extremely soft and strong fabric which is produced by combing the yarns to remove any lint or short fibres which would stick out of the material if unremoved and cause a prickly sensation. Other types of weave include sateen which uses the weave structure of satin but uses cotton yarns rather than silk. 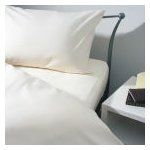 Bed Linen, Brushed Cotton, Egyptian Cotton, Percale, Polycotton, Thread Count. Bookmark.